Sudoku stymied me. I did not want to work the daily puzzle because I failed, and I did want to work the daily puzzle because I failed. It was a lot the way I felt about writing when I started out. 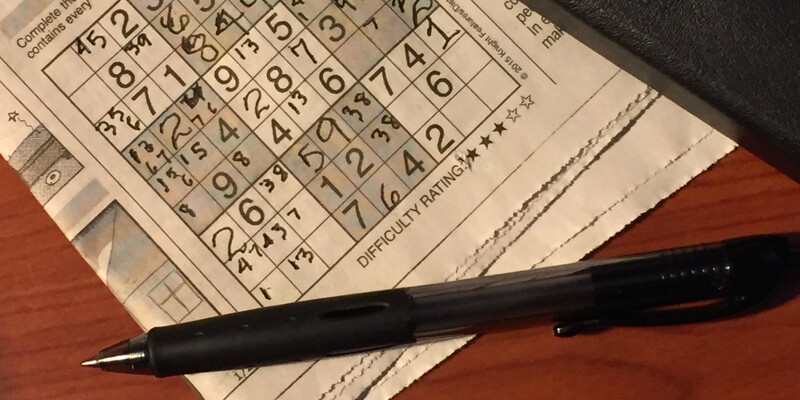 With Sudoku it wasn’t long before my urgency to make the puzzle work overcame my discomfort with failure and I bought a book of puzzles with a section of strategies for filling in those nine by nine squares. For a while I worked puzzles with a single-minded focus. I x-ed out the complete failures and tried another one until I began to get it right more of the time than not. Simple, right? Obvious. But in my desire to finish the puzzle I had been stopped by all the squares I had not and could not fill in. I went back over the grid and found one square I could fill. Then another. Absorbed in doing what I could, I was surprised when, in a little while, the entire grid was filled. I had completed the puzzle without realizing it. I’ve been working on a novel for quite a while now. Writing it in between writing poems and essays and teaching classes and being a mother/sister/wife/grandmother. When I heard that inner voice say, “Do the squares you can do,” I was stymied in the midst of revising the novel. Blocked by the sheer mass of pages and the “undoneness” of the whole. Were there easy squares I could fill in? And couldn’t I use this same tactic to complete the sequence of poems I had struggled with for a while? I began to look for the easy squares, not only in my poems and the novel, but also as I dealt with an unusual string of family crises. If I could calm myself down and do what I could do rather than focus on what I could not, knots began to unravel. I still fail a lot of the time — the poem doesn’t work, the novel revision is ongoing — but more often, finding what I can do loosens what had felt impenetrable. Looking for the easy square makes me smile. Even if I don’t succeed every time, I’ve discovered a way of working that often leaves me gratified and surprised. I look up and see that the final square is filled. The poem is ready to submit again. My sister’s voice sounds lighter on the phone. The novel is finding its way. Love reading what you write! Cannot wait for the novel! Leatha, there is so much wisdom here, and I appreciate reading it today. It reminds me of the advice another friend passed along in graduate school when the projects were too big and the work too daunting. “Just chip away” at it, she said. Do what you can do, a little at a time, and you’ll get there. And you know what– it’s true! I appreciate you putting that in front of me once again.